ABLE (Accessibility for a Bolder Learning Experience) is an initiative brought by the Office of Information Technology (IT) in collaboration with the Student Affairs Accessible Education Office at the American University of Beirut (AUB). 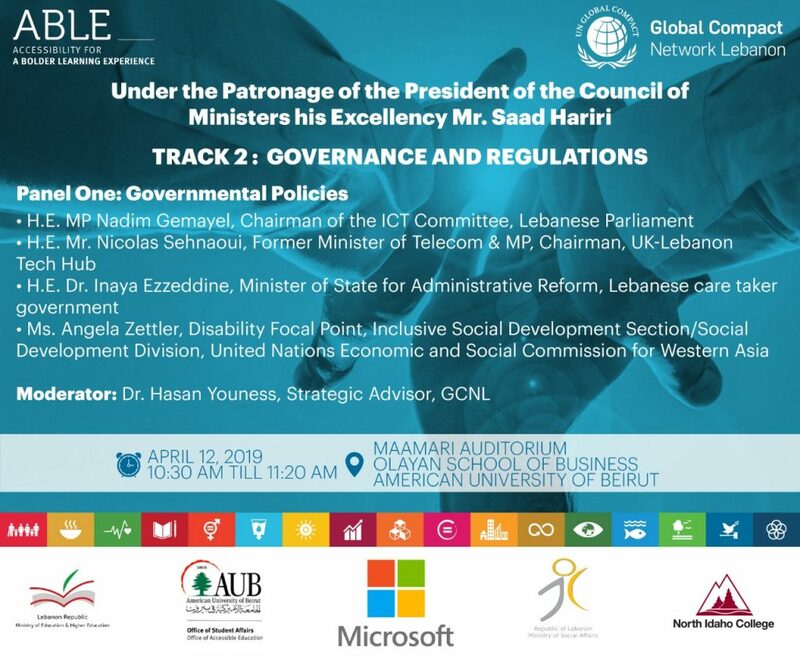 Powered by GCNL, the Governance & Regulations track will take place on April 12 at the American University of Beirut, Olayan School of Business during the ABLE Summit. This track will showcase two panels titled Governmental Policies (10:30 am till 11:20 am) & Institutional Policies, Challenges & Priorities (1:30 pm till 2:20 pm). This summit represents a collaboration forum that brings together over 200 participants of experts, frontline workers, innovators, vendors and end users to share innovations, best practices, implementation strategies, research and education in assistive technology (AT) and accessibility. You can find more information about ABLE here. If you would like to attend this event, kindly register here.